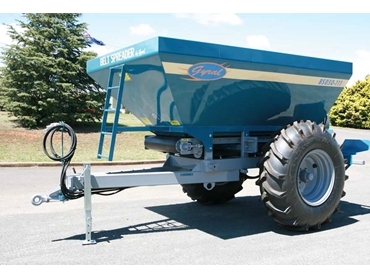 Gyral Implements introduce a range of belt spreaders combined with a silage feedout wagon to complement the existing range of seeding and tillage equipment. The Belt Spreaders can be used for a wide range of products and spreading applications from granular fertiliser to lime. Material is delivered to the rear of the spreader via a highly robust, hydraulically powered, rubber conveyor belt that is supported by durable stainless steel rollers and shafts. The speed of the hydraulic drive can be adjusted through the flow control valve. The product is then evenly distributed by a series of dual spinner discs. The dual spinner system is also powered by hydraulic motors and each spinner features four stainless steel flights that are fully adjustable. The Belt Spreader can spread product up to a distance of twenty metres, however spreading area will depend upon the product being used.